Gas spring arm desk mount supports most 15" ~ 34" displays, pneumatic assist makes free motion effortless, Constructed of high-grade aluminum and steel. Displays can be individually swivelled ±90° to get the optimum viewing angle, Cable management clips help keep your workstation neat and tidy, Easy installation. High-end 27" 16:9 InfinityEdge IPS Monitor 2560x1440 with best-quality gas spring desk stand. Move/rotate your monitor with ease. Dell U2717D UltraSharp 27" 16:9 InfinityEdge IPS Monitor. This display is built with an In-Plane Switching (IPS) panel that provides you with wide 178° viewing angles and vivid color reproduction. The 2560 x 1440 resolution has roughly 1.77 times more pixels than a standard Full HD display so you'll be able to enjoy crystal-clear details. Furthermore, it has a 350 cd/m² brightness rating, a static 1000:1 contrast ratio, an 8 ms response time, and supports 16.7 million colors for immersive, lag-free content reproduction with darker blacks and brighter bright colors. Connect this display to your system via HDMI, DisplayPort, or Mini-DisplayPort and then adjust it to your viewing preference. If required, you can install an alternate mount or stand using the 100 x 100 mm VESA mounting holes on the back of the display. Gas-Spring Adjustable Articulating Monitor Arm let you place your LCD display wherever you want it. 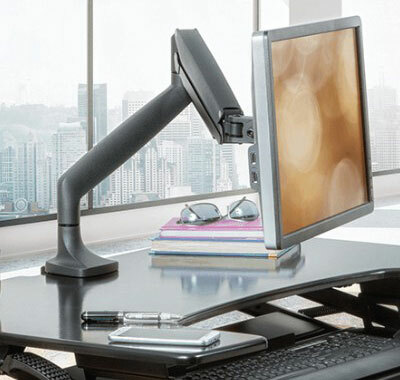 Suspending the monitor up off your desk, the arm reduces desktop clutter and frees up valuable desk space. Even better, the counterbalanced gas-spring arm lets you easily adjust the monitor to the most comfortable position, helping reduce strain on your neck, shoulders, and eyes. The Gas-Spring Adjustable Articulating Monitor Arm enables endless monitor adjustment and smooth movement in any direction, including height up and down, extension / retraction forward and back, monitor tilt, swivel, and rotation for ideal ergonomic alignment. And unlike the competition, our mounting arm is rated for large monitors including most 34" models, making it perfect for any home or office.